Train your unconscious to stop the vibrations and allow you to roll over before you snore. Do you have problems sleeping? Do you they say you snore or grind your teeth? Listen to the audios in this sleep series to develop new sleeping habits and wake up feeling refreshed and relaxed. You can’t even hear the noise you’re making but it’s keeping other people awake. Snoring is caused by a vibration as the air passes the fatty tissue in your throat. This audio works in two areas; firstly in alerting you of any snoring so you can turn yourself over and sleep on, and also in encouraging those muscles that control that fatty tissue to tighten. Listen, relax and sleep quietly. Stop snoring will help to quieten everyone. 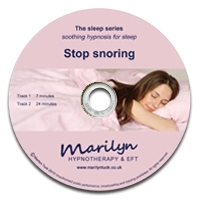 Stop snoring is perfect for all ages from 16 up. Always listen when you are resting as it either sends you off to sleep, or lets you roll over afterwards and go to sleep. If you awaken in the night you can use it to relax you back to sleep. Listen at least 5 times in the first week, 4 in the second week, and then 3 times in the third week or continue until you sleep peacefully and quietly through the night. Come back to Stop Snoring if anyone starts to complain again. All in this sleep series allow you to relax to sleep.